Every child loves drawing and painting. However, sometimes the results aren’t exactly masterpieces. Perhaps your child just needs another method of expressing themselves? If you think the answer to that is ’yes’, then it’s time to encourage your kids to experiment with different techniques. We’re sure there’s something out there that could become their new favorite choice. So get ready to see your little artist to try something new! We at Bright Side made a list of the most unusual drawing techniques available for kids to try. First draw a simple squiggle as an outline. Then a cotton swab and gouache or acrylic paint to make intricate spot patterns to your liking. Mix the paints on a palette beforehand and add some water. This technique is learned early on and loved by many children. Simply place a textured object under a sheet of paper and cover it with pastel paints, crayons or a blunt pencil. By dipping a sponge into thick gouache paint, your child can create landscapes, flower bouquets, lilac branches, and various animals. There are two variants of this technique. If you choose the first one, put some paint onto a sheet of paper and gently turn the paper from side to side with your hands to turn a formless blob into an image. The second variant is a bit different: your child needs to dip a brush into some paint, then makes a blob on the paper, and fold it to make an imprint on both sides. Then they need to unfold the paper and try to figure out what the image looks like. This technique is really quite simple: all your child has to do is dip their hand or foot into some paint and make an imprint on the paper. Then use the power of their (and your) imagination to add some details. For this one, cover sheets of paper with thick layers of different colored paint. Then use the opposite side of the brush to scratch various lines and flourishes out of the colored paper. When the patterns dry, cut them out and glue them onto thick paper. The name speaks for itself. Cover your fingers with a thin layer of paint and make an imprint. Add some strokes with a marker, and that’s it! Draw a pattern on a smooth surface (glass, for example). Then make an imprint by holding a sheet of paper over the painted glass. To make it blurry, soak the paper in advance. When the image dries, you can add any details you want. As the name suggests, this method involves ’scratching’ an image. A sheet of cardboard should be shaded with spots using multicolored oil pastels. Then use a palette to mix black gouache paint with soap and cover all the outline with this mixture. When the paint is completely dry, use a toothpick to scratch whatever image into it that you like. To make this paint, mix a tablespoon of self-rising flour, several drops of food coloring, and a tablespoon of salt. Add some water and stir the mixture until it has the consistency of cream. Then place the paint onto some icing piper. For this technique you can use either paper or cardboard. When the image is ready, put it into a microwave oven for 10-30 seconds at full capacity. Cover a sheet of paper with yellow acrylic paint. When it’s completely dry, add a layer of diluted pink paint and cover the image with plastic food wrap. Then purposefully wrinkle up the food wrap to make ’marble-like’ patterns. When the paper is dry, take off the wrap. 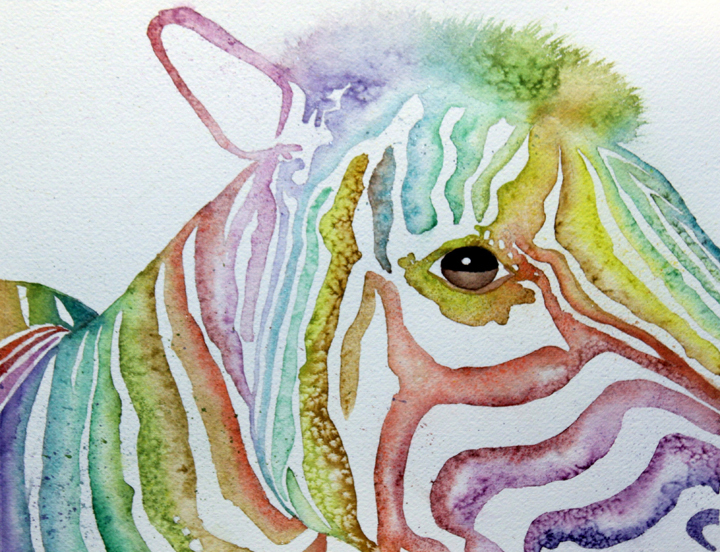 Draw a simple pattern with watercolor paints and then cover it with water. While the paper is still wet, add some colorful blobs of paint to create a beautiful and smooth ’blending’ effect. Cut some pieces of fruit or a vegetable into two halves. Then carve a pattern on each of them or leave it as it is. Dip the halves into paint and make imprints on paper. You can use a wide range of different fruit and veg: an apple, a potato, a carrot, celery. This technique involves using the same principle as the previous one. Simply cover some leaves with paint and make imprints on paper. If you spread salt on a watercolor painting when it’s still drying, the salt will become saturated with the paint. When the image dries off, it will have acquired a wonderful granular effect. Try something new for a change! For example, drawing with a household brush. You’ll need a container with water. Its size should precisely coincide with the size of the sheet of paper you’re using. You can also use a baking tray. You will need oil paints, solvents and a brush. This technique requires making patterns on water with paints and then dipping a sheet of paper into the water. Use wax pencils to make an image on a sheet of thin paper. As you can see here, we decided to make a flower. All of the background should be crosshatched. First crumple up the paper and then smooth it out again. Then cover the whole piece of paper with dark paint. Rinse the drawing with water and let it dry. You can also try ironing it. Cut some cardboard into small strips, each 1.5×3 cm. Then dip one side of each piece of cardboard into some paint, hold it vertically over the paper and pull it across in a sideways direction. You will get wide lines that can form a basis for a really unusual image. To make this kind of image, your child should clench their fists. Then dip their fist into some paint and make imprints on the paper. Feel free to add any details you want. One great idea is to draw an underwater scene like the one above.